Denon DBP-1610 review | What Hi-Fi? Denon is a dependable brand when it comes to AV electronics. 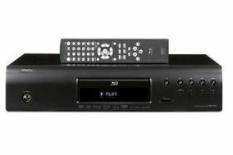 Doing its best to cover the full spectrum of price categories across AV amplifiers, Blu-ray players and much more, the company invariably stands for solid and stylish build quality, extensive specification, and a dependably high level of performance. However, Denon hasn't managed to provide that extra sparkle to take top honours with its recent Blu-ray players. The DBP-1610 is looking to change that. The '1610 can decode all HD audio formats onboard, or send them untouched over HDMI if you'd rather your home cinema amp did the work. There's a dedicated two-channel output for audio and a digital coaxial output, though you have to step up to Denon's DBP-2010 for multichannel analogue outputs and the addition of a digital optical output. The '1610 is a Profile 2.0 player complete with Ethernet connection – over which you can do firmware updates and access BD-Live – and it has an SDHC card slot for adding up to 8GB of memory. As expected, it's a smart package, with even the disc tray feeling and sounding slicker than the competition. There's no aluminium front panel, as on the pricier '2010, but it feels weighty and built to last. The remote, complete with glow in the dark keys, is easy to use. Playing Gran Torino on Blu-ray, the picture impresses. The understated colour balance is faithfully rendered with sufficient subtlety, giving plenty of insight and texture. Motion is handled smoothly but there isn't quite the same definition to edges. Similarly, while skin tones and overall detail are good, more expansive shots aren't quite as clean or revealing as the best in class. Sonically, again we're happy in isolation with the crisp, intricate delivery, but the benefit of comparative testing finds the '1610 lacking a little body and dynamic reach. Knowing provides plenty of powerful hits and sweeps, where the Denon is found to be missing a touch of power. The DVD of Hitman delivers detailed sound and vision that only lacks a little black level insight, while CDs deliver a typically uneventful but passable performance. You could wander in to your local AV dealer, take this Denon player home, and be perfectly happy. But there are better products out there.